A large number of reviewers find the high-top Primeknit upper flexible and comfortable because of its sock-like fit that wraps around the foot keeping the feet warm for hours. Numerous customers of the Adidas Forum Primeknit Winter noted that the weather-proof membrane gives reliable protection as it insulates and keeps the feet warm for several hours outdoors. The lightweight cushioning of the EVA midsole and the Ortholite sockliner makes many wearers feel cozy and relaxed while wearing the sneaker. Several wearers disclosed that the thick rubber outsole has high traction and grip even on slippery and snowy surfaces and floors. The water-resistant upper according to some users don’t quickly get drenched in rainwater and snow during cold winters. A couple of reviewers like the reflective rope lacing as it gives a bright accent and added visibility at night. Internal shoe comfort is improved by the soft textile lining and Ortholite insole according to some buyers. Some users find the tongue pull tab useful for easy entry and exit into the high-cut footwear. All-weather built makes it perfect for daily wear anywhere in the city. Some original Forum fans claimed that despite the modern interpretation of the basketball sneaker all OG details from the sole to the upper remain intact. A considerable number of users like the street-ready style and bootie construction of the Adidas Forum Primeknit Winter. A few users of the Adidas Forum Primeknit Winter find the water-repellent membrane a bit lacking in the lining of the tongue and in the areas where there is creasing where drops of water tend to enter. Some sneaker fans would have wanted better materials for the sole because it felt heavy and a bit stiffer compared to other modern outsole materials used today. The legendary basketball silhouette of the Adidas Forum gets a modern winterized version in a bootie Primeknit silhouette for a reasonable price of $170. Retaining OG details of the iconic shoe, the Adidas Forum Primeknit Winter has a weather-proof insulating membrane that wraps through the upper to keep the foot warm and dry for the entire day. The thick rubber cupsole has a solid grip even on wet and snowy surfaces while its Ortholite sockliner and EVA midsole offer relaxed cushioning to last for hours. Since it was established in 1949, German footwear manufacturer Adidas has been at the forefront of making iconic shoes. While they first settled on creating football and running shoes, it has since diversified and branched out to various sports that include basketball. Prior to the release of the Adidas Forum in the 1980s, the German brand has already had its formidable court models that competed with pioneering basketball brands like Converse. These shoes include the iconic shell-toe Superstar and the Pro Model kicks that stood out in the court. With the rising popularity of basketball in the 1980s and new brands like Nike getting a massive chunk of the market, the German company had to brace themselves with new designs that include its iconic Adidas Forum. Retailing at $100 and featuring a built-in strap, a high-cut silhouette, and thick rubber soles, the Adidas Forum was geared for intense court action. Through the years since its release in 1984, the Adidas Forum had several makeovers with the introduction of new materials from synthetic, leather, and mesh. As part of its 25th anniversary in 2008, the Adidas Forum went all-silver in the upper with some embossed details signifying its limited edition release. More recently the Adidas Forum had its Primeknit iteration in the first quarter of 2017. This modern version was followed by the Adidas Forum Primeknit Winter released on October 27, 2017. The winter-ready version had a weather-proof membrane spread out across the upper that serves as an insulator to keep the feet warm and dry from rain or snow. Coming in gray and red colorways, the high-top sneaker projects a stylish silhouette with its sock-like Primeknit wrapping the foot above the ankle in a bootie-shaped cut. Best paired with winter clothes, thick overalls, and padded jeans, winter kicks no longer have to be bulky boots as the Primeknit material with reflective lacing that goes all through the lower leg keeps this sneaker trendy. The ribbed elasticated Primeknit material goes all the way up the ankle with a pull tab for easy entry and exit at the tongue. The heritage basketball-inspired profile of the Adidas Forum Primeknit Winter has also been kept intact with the thick rubber sole and welded signature Adidas three-stripes. 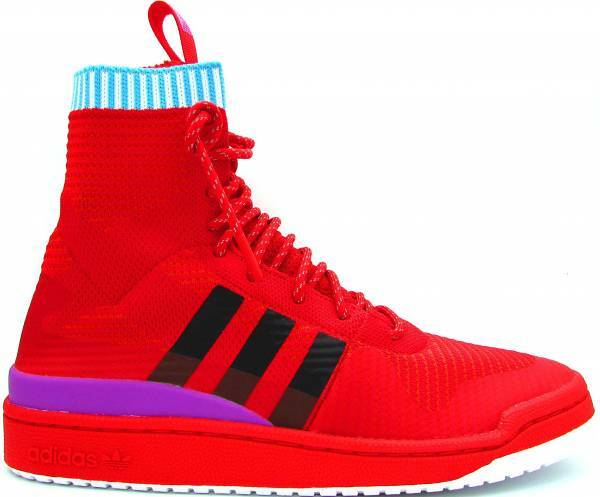 The sock-like fit of the high-top Adidas Forum Primeknit Winter assures wearers of a secure fit. This is further secured in complete lockdown by reflective rope shoelaces that go all the way above the ankle while its insulating membrane over the Primeknit material keeps the feet warm and cozy. The sneaker runs true to size and comes in exclusive sizes for men in medium – D width. Size ranges from US 5.5 to 12.5. Taking prominence into this Winter-ready version of the iconic Adidas Forum is its Primeknit upper material with a weather-proof insulated membrane that keeps the feet warm and dry all day and all through the season. The Adidas Forum Primeknit Winter also has an Ortholite sockliner and EVA midsole to improve comfort levels through the cold months. The Adidas Forum Primeknit is lined with weather-resistant membrane for warmth and waterproofing. The TPU heel strap has an Adidas printed logo while the heel strap also has a Hiamovi logo on the part of the heel strap and sockliner. The Lateral TPU cover offers increased durability and protection. Reflective rope laces come with Polyurethane endings for added visibility.